A book entitled 'Africa-Centred Knowledges' is bound to be opened with hope, arriving as it does at a time when university leaders throughout South Africa are reflecting urgently on the state of their institutions, and when civil society as a whole is feeling grave concern about the slow pace of transformation and Africanisation in higher education. Where academic transformation involves material issues - such as greater student access and support, as well as the right of workers on the country's campuses to decent jobs, fair pay and benefits - these may now have been temporarily, if belatedly, addressed. However, the concept of Africanisation, even while it is intertwined with transformation, is harder to pin down - and it is this topic that the papers collected in this book bravely grapple with. The book comes with a reassuring pedigree: we are told that it had its origins in an academic collaboration spanning three continents, which began in 2005 with footholds in departments of African Studies at Brown University in the USA, at the University of the West Indies at Mona, and at the University of Cape Town in South Africa. As one of the outcomes of this collaboration, the Africa Knowledge Project was established in 2009 at the University of Cape Town, and it was under its auspices that a workshop was held in 2011, where the papers collected here were first presented for discussion and refinement. The book is split into two parts: the first contains papers of a broadly theorising nature, and the second contains case studies that demonstrate various practical aspects of the theoretical concepts. The introductory chapter by Brenda Cooper and Robert Morrell (p. 1-20) provides a useful overview of the kind of thinking that informs the book as a whole, and is commendably characterised by a desire to avoid simplistic binary oppositions. For example, they tell us that the collection 'is poised in a creative and productive third space between the polarisation of the bad place of Eurocentrism and the immovable rock of Afrocentrism'. We are assured that all the contributors appreciate that 'Africa is not homogenous or monolithic'; and we are also assured, if only obliquely, that while all the authors 'consciously contribute' to 'southern theory', they are aware that some countries wrestling with colonial legacies and enduring social inequalities are physically located in the northern hemisphere. Lastly, for those of us out of touch with trending topics in this area of rapid academic growth, there is a brief account of the 'maelstrom surrounding the definition of modernity'. Amongst other things, we are told that 'western capitalist forms of the industrial nation state, a market economy and, most especially, positivistic scientific methods, have come to define the substance of modernity itself'. The old-fashioned reference to scientific positivism is probably meant to arrest our attention, with its connotations of vintage debates around absolute truth and the role of empiricism in the social sciences. It also prompts us to reflect on the book's title, with its awkward (some might say pompous) use of 'knowledges' in the plural. This is no doubt equally deliberate, and drives home the well-established idea that knowledge is not monolithic, and that there is scope for pluralism, at least within the social sciences and the humanities. Most of us will have no difficulty in conceding the relative and not always empirical nature of knowledge in such domains. A first small discomfort may be felt, however, when it starts to emerge that the agenda of some contributors to the book is to conflate this pluralistic conception of 'knowledge-making' in the humanities, and the concept of an Africa-centred approach -in short, by suggesting that African ways of creating, formulating and disseminating that which is known about society and nature are somehow 'other'. It is clear that a dilemma arises when we try to address aspects of 'the African predicament', such as the extreme social divides still so deeply entrenched in many of its countries, and associated with these, the almost brutal impediments to access, whether it might be to education, healthcare, housing, welfare, or economic participation. The dilemma is that when we try to confront such difficult things, it is all too easy to speak in terms that suggest the need to 'catch up' with 'more advanced' societies located in a notional 'northern hemisphere' - and by using such terms, to imply that Africa (that rather vast continent) is entirely lacking in history, innovation, systems of knowledge, vision, strengths and capacities of its own. The contributors to the book are deeply mindful of this problem. Their approaches are diverse and fairly complex, but the elaborate frameworks they each build for their particular purposes are all loosely woven through with one or more of the various strands alluded to above. The catch that is hauled out by means of these different fishing traps is intriguing, if in the end disturbing. While the bulk of it seems to be made up of fishes that could have been caught almost anywhere in the world, there are on the other hand a few specimens so narrowly localised in distribution that they hardly qualify as universally African. Lastly, there are a few creatures that are fascinating in their own way, yet perhaps are not really part of the intended catch at all. Another interesting contribution in this section is the examination by Mbugua wa Mungai (p. 93-108) of ways in which popular musicians in Kenya may use their art to express subversive critiques of society and politicians. While it is not clear why this should be seen as a specifically African phenomenon, the paper itself is richly informative. The two final papers in the first section are literary analyses. The contributor of one of these (p. 64-77) draws on evidence from 'the African novel' - in fact the work of Chinua Achebe, Dambudzo Marechera and Ben Okri - to conclude that African time is 'non-linear', and reflects a different kind of knowledge, where time is apparently 'circular', 'layered' or 'folded'. The author of the other literary paper (p. 78-92) examines the creative work of Helen Oyeyemi, and concludes that this writer has the (apparently remarkable and uniquely African) capacity to perceive the world in ways that go beyond the preconceived. Each of these conclusions in its own way deepens the small sense of unease some readers will have begun to feel from the outset. 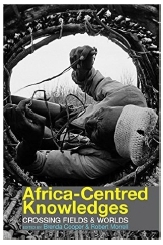 The second part of the book contains papers that are intended to illustrate various aspects of the 'Africa-centred knowledges' mooted in the first part, as they might be manifested in practice. Several, however, merely suggest a need - surely well established and long recognised internationally - for approaches to information-gathering and design to be less top-down, and to involve target communities in a more egalitarian way. One paper (p. 111-125) speaks, for example, about the scientific management of fish resources in Namibia, and tells us that 'fishing captains have a deep knowledge of the fish they hunt', and that 'any decisions made about fishing in Namibia would benefit from including fishers' knowledge, and from a conversation between scientists and fishers that develops a holistic and shared eco-knowledge'. Another paper in this category (p. 126-141) looks at the roll-out of information communication technologies in southern Africa, and some of the unexpected problems, aside from purely technical and logistical ones, that have been encountered along the way. The authors conclude that the design of applications and user-interfaces could be improved by a greater awareness of 'local-context information', and by communicating and interacting more directly with local end-users. A third paper in this category (p. 142-162) addresses urban planning and the making of knowledge about health and environment, with specific focus on the problem of housing provision in Cape Town. The authors find that amongst the residents of Khayelitsha, the concept of well-being includes a spiritual dimension. This is apparently so unusual (and so African) that they are led to conclude that 'northern urban-planning approaches and southern urban realities do not make a perfect match'. Lastly, two papers look at approaches to learning, researching and writing in the academic environment itself. One of these (p. 178-190) is a 'meta-reflection' on processes that went into the production of a previous book on postgraduate writing, which addressed problems encountered by young researchers from 'the geopolitical periphery'. The paper speaks to the difficulties faced by emerging researchers who are expected to present their findings in a language that might be only their second or third, in a register deemed appropriate for a particular discipline - where these dominant conventions are seen as a further manifestation of 'northern' values. The authors describe their pedagogic experiments with writer circles, in which postgraduate students could safely try out the formulation of their ideas 'before taking them in writing to more threatening audiences'. In this kind of context, they suggest, the taking of risks may have positive benefits, and what is more, may be more easily accommodated in countries like South Africa 'than in the more stable "northern" institutions where quality-assurance regimes are more deeply entrenched'. It is not clear, though, why it should be assumed that similar difficulties are not faced by millions of young people around the world today, or that similar student-centred approaches to learning, teaching and evaluation have not been tried out and implemented at higher institutions around the world. The second paper in this last category (p. 191-205) provides a case study by Leadus Madzimu of a Zimbabwean secondary school, and finds a link between the unexpected academic success of deeply disadvantaged learners - and the positive sense of community-located identity and self-worth that is inspired by the concept of ubuntu, or hunhu in the cognate Shona word used by the author. This principle is said to empower young students, in the sense that personal application and aspiration are supported as a collective good. What this paper reflects on are really some of the precursory factors to the successful making and acquisition of knowledge itself, but it is nevertheless one of the more intriguing specimens hauled up in the by-catch. It would be interesting to know about any cases in which the concept of ubuntu/hunhu might be present, and yet the expected success does not occur; and it would also be interesting to know whether similar concepts (having similar effects) exist under different names in the vast areas of Africa where other, unrelated languages are spoken. On reaching the end of the book, it is difficult not to think that the promised expounding of 'Africa-centred knowledges' has turned out to be the big fish that got away. Such a troubling thought even inspires a re-reading of the opening chapter, in a last attempt to isolate what kind of knowledges the various contributors would have us understand as both uniquely African and Pan-African. On second reading, though, the introduction is even more discomforting than it seemed at the outset. For example, the authors add an enhancement of their own to the paper mentioned earlier, on 'the African novel' -remarking (p. 10) that its author 'thickens the interrogation of modernity" by scrutinising 'the fallacy of time as linear', and stating that he 'embeds Afro-modernity in a concept of time in which the past and the present are intertwined, destroying the binary between archaic pasts and progressive presents'. It seems we are to understand that there is an African concept of time, and that it is different from everyone else's. They also tell us that 'embodied knowledge' represents a source of evidence too often discounted by mainstream gatekeepers, and they point us to the paper on urban planning, whose authors, they suggest (p.16) 'derive a visceral sense of the relationship between people and the cities they inhabit, by inviting them to map their bodies onto their living spaces'. It seems we are to understand that there is a viscerally accessible level of knowledge that is uniquely African, and which is oppressively disregarded by those who take a 'positivist' approach, or those with a 'northern' orientation in general. Finally they suggest (p. 18) that one of the things constitutive of Africa-centred knowledges is a 'hospitality towards all ideas'. It is not clear why a liberal and open-minded approach to ideas should be presented as uniquely African. The very assertion leaves us with a renewed sense that a few (but by no means all) of the contributors to this project may be attempting consciously or unconsciously to seek validation and acceptance of various treasured approaches of their own - by projecting them as somehow special, and somehow African. This book was opened up with eagerness, in the hope that it might help to formulate and illustrate some of the changes so direly needed if South African universities are to start achieving full transformation, and Africanisation in particular. If this is all that is on offer -almost a quarter of a century since it became clear that the end of apartheid was in sight - we should probably brace ourselves for another year of troubles and disruptions on our campuses.